The Spotify Web API team pushed out a new feature recently that extends the search API to include playlist search. With this new feature it is now possible to search across all of the popular public playlists created by Spotify users. 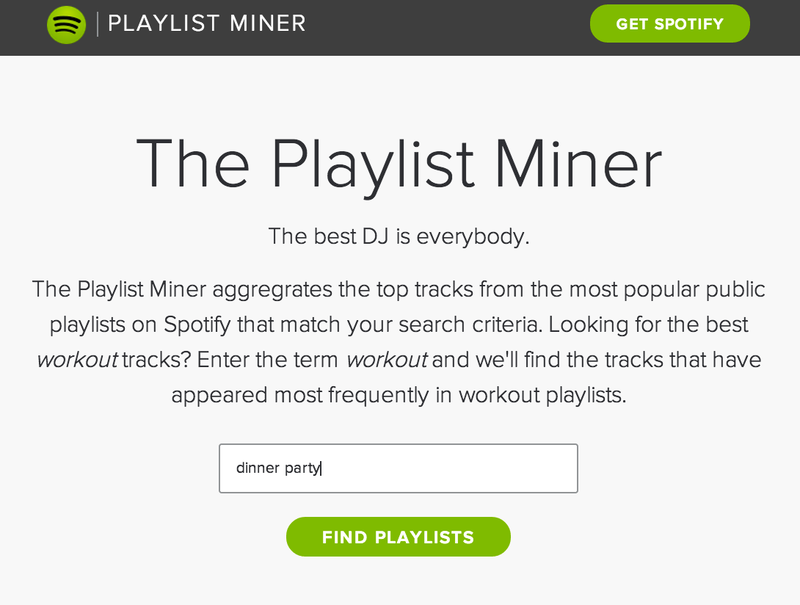 To try out the new search capability I created a new web app called The Playlist Miner. 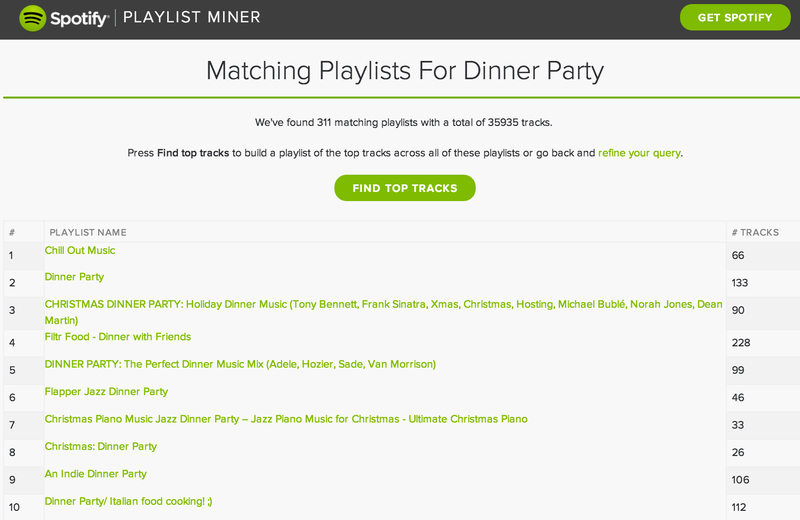 The Playlist Miner will find up to the top 1,000 most popular playlists that match dinner party. It shows them to me, giving me a chance to refine my query to focus in on the exact type of playlist that I am interested in. 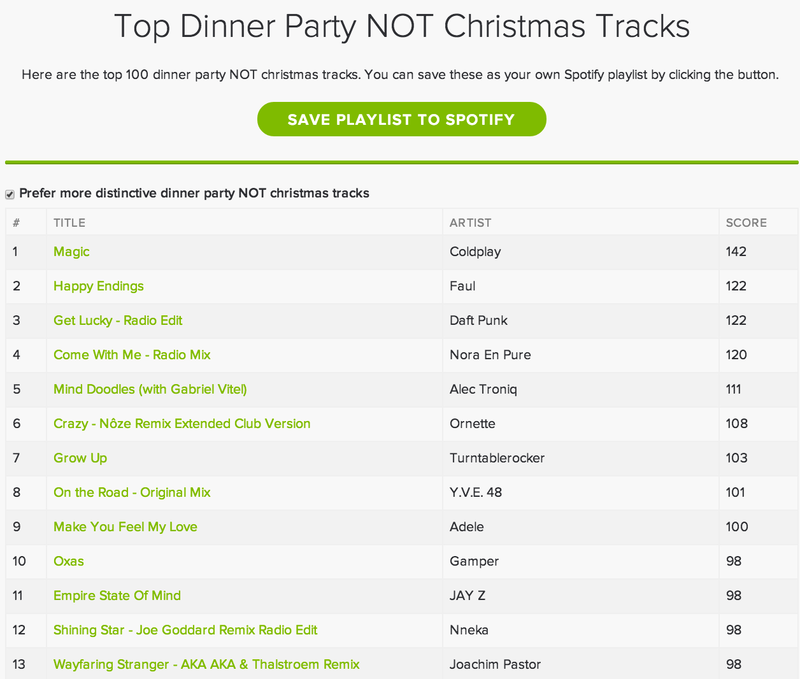 The resulting playlists are suitably non-Christmasy. 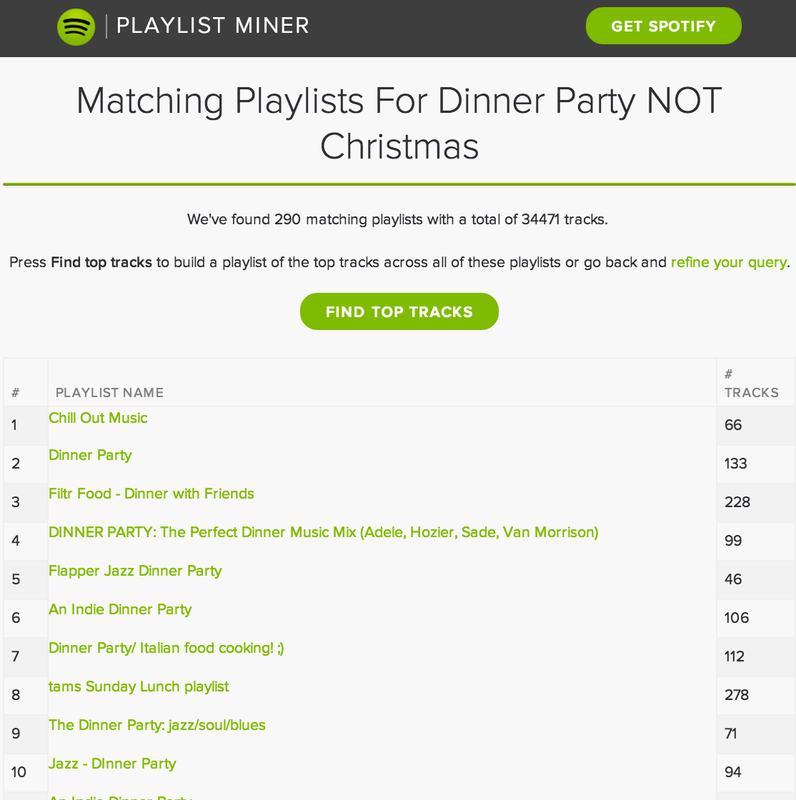 I like the look of these playlists so I hit the Find Top Tracks button and The Playlist Miner will scour through all of the matching playlists (290 of them in this case) and find the most frequently appearing tracks. Once the top 100 tracks are found, I can save them to Spotify as my own playlist. Selecting Prefer more distinctive labor and delivery tracks adjusts the track order for popularity so that tracks that are more distinctive to the particular playlist context will rise to the top. You can also use logical operators to focus in on the exact type of playlist you want to. You can search for “work out” OR workout NOT running to find workout playlists without running in their titles/descriptions. Under the hood – The Playlist Miner uses lots of bits of the Spotify API – user authentication, playlist search, playlist reading, playlist saving and more. The app is a an API calling beast – aggregating all the tracks from a thousand playlists requires 1,000 API calls. It’s a testament to the Spotify Web API that it doesn’t even blink under the load. You can play with the code on github. It’s fun to use The Playlist Miner to explore the quirkier aspects of how people listen to music. There are ironing playlists and sleeping baby playlists. There are playlists for getting psyched and playlists for Labor and Delivery. With the Playlist Miner you can pull from all the playlists created for a particular purpose and build your own. Give it a try. Over the last six months or so The Infinite Jukebox had a link to a survey about features peopled would like to see in a mobile version of The Infinite Jukebox. Since then, over 10,000 people have taken the survey. Here are the results. Since the text in link to the survey was “Interested in a mobile version of the Infinite Jukebox? Then take this one minute survey” it is no surprise that 99% of all respondents are interested in a mobile version of the app. The split between Android and iOS aligns with other iOS vs Android metrics out there on the webs. As for how much people would be willing to pay, 64% would be willing to pay something for the app. This was a bit surprising – 70% of folks want to play music from their own collection, and only 11% are interested in playing music from a streaming service like Spotify or Rdio. Thanks to everyone who took the survey, its been quite informative. This is six hours of Thanksgiving music. All the classics are there, from Alice’s Restaurant to We are going to be Friends by the White Stripes. It should get you through the Thanksgiving drive, the meal, dessert and maybe even an after dinner snack. However, if you want to synchronize your cooking and your music listening, there’s no better way then to hop on over to Time For Turkey for your basting+music needs. I’m on my way to Outside Hacks – a hackathon tied in with the Outside Lands music festival. Since many hacks at the hackathon will be related to the festival it is pretty important to have a machine-readable version of the artist lineup for the festival. However, I couldn’t find any online. Since I had an hour in the airport lounge, and the airport actually has decent WiFi, I thought I would try to be a good hacker citizen and generate an easily parseable lineup. It’s about time to get on the plane. If you can think of other interesting data to add to the lineup json let me know and I’ll try to add it before the hackathon.